at least 14 Leonids and one sporadic meteor. This article was originally published in the Longmont Astronomical Society Journal in December, 2001. The article was put together from cut and pasted comments of LAS members on the FRAC e-mail list. The idea was to give different perspectives on this memorable event in a chronological order. Since it was a very significant event that will undoubtedly remain in the memory of all who witnessed it for the rest of their lives, I thought it would be nice to reproduce it here for others to get the flavor of the event, with added photographs and the names of the quoted persons reduced to initials to preserve their anonymity somewhat. My apologies once again to the original writers. KB: "We had a FANTASTIC time; I can understand why people would want to travel to see meteor storms just like eclipses." JC: "This is a meteor storm I will remember for a life time!!!" DD: "This past year has provided a lifetime of great observing memories and last night may have made it the best ever!" DE: "Well folks, I'm jealous! If you were all wondering what happened to those clouds on the satellite images, well, they followed me to central Nebraska." KM: "Quite a show! Let's do it again!" JS: "In a word: SPECTACULAR!!!!" DS: "Even from less than perfect skies, the show was the best meteor shower I've seen in my 35 years of observing (which began the month AFTER the great Leonid Shower of 1966!)." RW: "It was a fantastic show." DD at Cactus Flats: "Starting out the weekend Friday night provided another evening of the very good transparency we have been experiencing lately. Deep sky objects were nice and contrasty with the seeing better than the previous weekend (though still about 5/10). Our hope to catch some early Leonids was thwarted by a thick fog bank that moved in right at midnight. Saturday afternoon it was obvious that the "flats" would play host to a much larger crowd. By twilight there were more vehicles than I had ever seen in the field and folks would continue to arrive all night." TT at Cactus Flats: "There were at least 60 people at Pawnee, about 30 cars, folks joining the fray until 2:30am." JS at Cactus Flats: "That had to be an all time record attendance at Cactus Flats. I heard someone say they stopped counting after thirty some odd cars had shown up. There were still cars coming and going up CR65 at 4 a.m., much to the consternation of all the dark adapted and film exposing folks there." GG at Cactus Flats: "I thought maybe we were at a summer star meet with the crowds that showed up at Cactus Flats. Biggest crowd of people (60 or so I would guess) Cactus flats has ever seen for any event in the past 15 years we have been using the site." DD at Cactus Flats: "Early evening had the atmosphere of a large star party with folks mingling around the field sharing telescope views and stories. You could hear the excitement in people's voices as they discussed the impending meteor shower. As the night progressed the clouds over the front range began to slowly move over us and covered the sky with a thin layer that you could still see bright stars through." 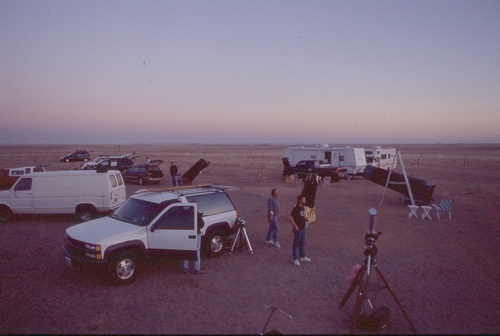 JS at Cactus Flats: "A calm sunset turned into a fairly chilly evening (about like Foxpark in the summer) and there were a lot of good views of planets and deep sky stuff to be had since there was a tremendous number of good sized scopes in attendance. Toward the later hours of the evening patchy clouds rolled in, then dissipated shortly before another wave obscured most of the sky for a while." RW east of Sterling: "On finding that Pawnee was clouded over, we [Ed. : One of the stereo photography experiment groups.] zipped out to the dark skies 10 miles East of Sterling. The skies were clear from horizon to horizon until morning." BK near Red Feather: "D and I put on our shower caps and headed up to the observatory. Got up there in the dark and set everything up for the night. Did a quick tour of some common objects and then the clouds came in. Closed the roof around 8:00 and got some shut eye." DS in Erie: "Thin clouds abounded when I stopped working on camera and trip to Pawnee plans at about 11 p.m. Decided to pack it in and do a re check around the predicted max (3am)." GG at Cactus Flats: "We had the fellow that leases the land show up with his wife and son and his wife and their kids for an awesome showing of Saturn, Jupiter, Orion, and more on my 30 scope earlier in the evening. I was very glad they came out for this event, because it does not get any better than that. We started at 6 p.m. and by seven we had already done 10 objects. By midnight we had two summer nights worth of views in, and still had 4 or 5 hours more of constant meteor barrage to watch. I can not remember a better night line up. "Our prayers for clear skies worked out well as the sea of clouds parted for our viewing pleasure. Around midnight the clouds started to roll in so we covered up the scopes to get ready for the meteor storm, and the clouds did part for us before the big event of the night." DD at Cactus Flats: "Nearing midnight several of us decided to cover our scopes in order to appease the Gods and hopefully clear away the clouds that were threatening to put a damper on our viewing. Right on cue we started to see Leonids. One of the first ones I saw started SE about 30 degrees altitude and actually skipped 3 times through the atmosphere as it traveled about 120 degrees across the sky! The clouds were surely hiding some meteors from view but there were still enough bright ones to keep everyone entertained." GG at Cactus Flats: "An early one that skipped through the sky was an awesome start for even better fireballs to come." JS at Cactus Flats: "Around 11:30 or so most folks had covered their scopes and taken to their lawn chairs to keep an eye on the intermittent but fairly slow and bright Taurid meteors that were still putting on their show. Around 12 ish the advanced scouts from the Leonids began arriving, the first or second of which gave us a great preview of what was to come as it's bright green demise came screaming out of the east and skipped three or four times off the atmosphere leaving a long, punctuated yellow train. It was followed by several more bright meteors visible through the murky sky that increased in number fairly steadily through the next two hours as the sky cleared to a wonderful transparency over most of its dome by 2 a.m."
KM in Boulder: "I must say, that even from a light polluted sky, and from a porch where I could only see about 35 40 percent of the sky (a strip from Orion in the south, all the way north along that swath of sky), this was the best I've seen! I know I missed many because my view was so blocked and because of light pollution. I kept going out to look at the sky starting about 11:00 checking on clouds. At about 1:30 I was getting things ready (planning on putting my lounge chair and goose down sleeping bag on my small porch) and was peeking out the window of my screen door when I saw an extremely bright golden meteor! Wow! My first of the night! That was about 1:30 and was all it took to get me into higher gear." BK near Red Feather: "When the alarm went off at 1:00 a.m., I looked out the door and 'OH MY GOD!!!' Billions and Billions of stars and some streaks going on. It didn't take me long to open the roof and fire up the camera. I opened the shutter at 2:00 a.m. and took about six 30 minute exposures." Above image courtesy Brian Kimball. KM in Boulder: "I was out and warm and comfy by 2:00 and was listening to the NASA channel narrate and tour the night sky. It was fun. They would be narrating, or just telling about a constellation and then would gasp or exclaim because they saw a meteor." DD at Cactus Flats: "By 2:30 a.m. the sky had opened up considerably and things were starting to really get going. The occasional fireball would light up the field to the cheers of all in attendance, usually leaving a "smoke" trail that could be seen for up to several minutes." DE in North Platte, Neb. : "I woke up to my alarm at 3 a.m. (central time) and went outside to the brightly lit hotel parking lot. I was greeted by the dewiest conditions I can remember seeing since I grew up back east. Being a trooper, I walked to the back of the parking lot and found a space on the ground shaded from direct light by a shed. There were some reasonably big gaps in the clouds that made it obvious that the transparency above that layer was spectacular. When Orion was visible, I could see the great nebula naked eye with no trouble. Overall, I'd estimate that the cloud cover varied from 50% to 90% over the 45 minutes that I observed. "During slightly more than a 30 minute period I counted 31 meteors varying in magnitudes from 2 to 3. Now, that doesn't sound like much, but consider that it is still three times the rate I remember seeing two years ago from Steve Lynch's rather dark front yard. It was obvious to me at the time that anyone at a dark site was seeing LOTS of meteors. I'm glad so many of you managed to get to Pawnee and other places with less clouds. At least I don't feel completely left out...."
JS at Cactus Flats: "From roughly 2 a.m. through the remainder of the night, it would have been utterly impossible to count the meteors. In any given 10 second period over the next two and a half hours, there may have been one or two individual seconds that no meteors were seen by any single observer, but the remaining eight seconds each contained as many as six or eight meteors! It was very common (every minute) to see three or four good bright ones arrive at once, or in split second succession. No part of the sky was favored, as they were visible at any given moment no matter what direction you were facing. Incredible! 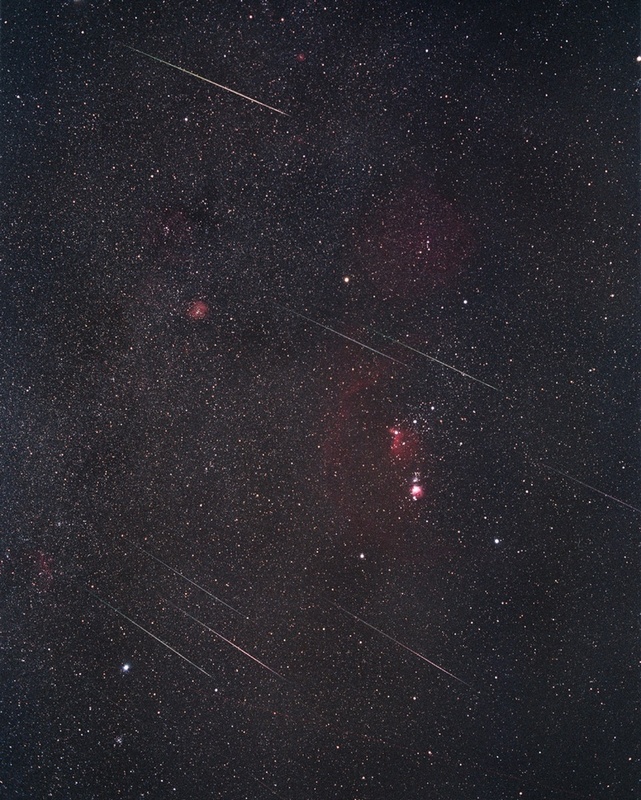 From time to time a bright yellow Taurid would "swim upstream" or cut across the path of the much faster Leonids, which enhanced the show as well." DD at Cactus Flats: "By the time of the predicted peak at 3:00 a.m. we were in a full storm, some were shouting out counts of up to 50 meteors per MINUTE! Every direction you looked there were meteors, sometimes 2 or 3 at the same time, sometimes more. It was without a doubt the most fantastic show I have ever seen. I had heard predictions of the peak lasting from 10 to 30 minutes, thankfully they were not even close. Meteors fell at a high rate for over an hour." RW east of Sterling: "We split into two teams and exposed one roll of Kodak Max 800. Terry ran a video recorder to capture meteors if lucky, but mainly to get the sound. At one point, Terry suggested, "I'm going to say 'MARK' every time I see a meteor." I agreed to do the same looking West. The result was hilarious as well as revealing as to the magnitude of the storm. There is no doubt that the peak was at least 1 a second (3,600 an hour)." GG at Cactus Flats: "We were all looking in different directions and calling out where and how many. We were hitting at least 8 to 10 per second at times. I would be yelling out four, five, or six and others would be calling out theirs too." KM in Boulder: "When it was supposed to be peaking I found myself getting very frustrated because these beautiful bright meteors would begin in my field of view and then disappear behind my house! Over and over and over this happened, because my field was so narrow. So from shortly after 3:00 to probably 4:20 or so, I stood, or sat on the railing of my porch, craning my neck around to get a broader field of view. I saw more meteors between 3:30 and 4:00 than prior to that, but maybe that is because of my position changing. Not more brighter ones, just more fainter ones, and many of those were to the north. I had not been looking that far north very much before then, but the north has less light pollution, so that's probably why. Since the density would come and go, sometimes I went 30 45 seconds without seeing one, but then I would see 10 in a matter of a few seconds. They did seem to travel in "packs". I thought I saw lots of little doubles as well." KB at Cactus Flats: "This definitely qualified as a storm by my criterion ("too many to count"). After a while, I was overwhelmed during one minute counts (>100 meteors); I did a few 5 second and one second counts, and I would guess the peak rate at 10,000 15,000 per hour. Even when you were looking at the persistent trail from a particularly bright meteor, you could see dozens of small ones zipping by. Woohoo! The peak lasted much longer than estimates." JS at Cactus Flats: "If on the average we were EACH seeing even one meteor per second (but actually much more), that would work out to 3,600 per hour per observer, which when corrected to ZHR would be a much larger number. I'm very sure there were periods when the rate easily exceeded 10,000 and possibly even more." GG at Cactus Flats: "The meteor storm was super spectacular. We were counting up to 10 sometimes in one or two seconds, so 3,000 per hour would be a low estimate. 10,000 is truly realistic. Like Kimon said it was futile to even keep trying to count the numbers. Some were so bright you could see the flash and have time to turn around and still see it, with one that took 5 minutes at least for its trail to disappear into the dark night sky. We were like the 4th of July crowds watching the great fireworks show, only way better than any fireworks show." TT at Cactus Flats: "We approximated 10,000/hr and the main shower lasted at least 2 1/2 hours. There were at least 5 bolides that exploded." JS at Cactus Flats: "Some of the really bright ones lit up the ground and were seen reflected off of cars and telescope tubes. They were usually a bluish green and left blue green trails that would glow in the sky for several minutes as the upper atmospheric winds would twist them into snake like, writhing forms." At left in the photo above is one of these minutes-long remnants. 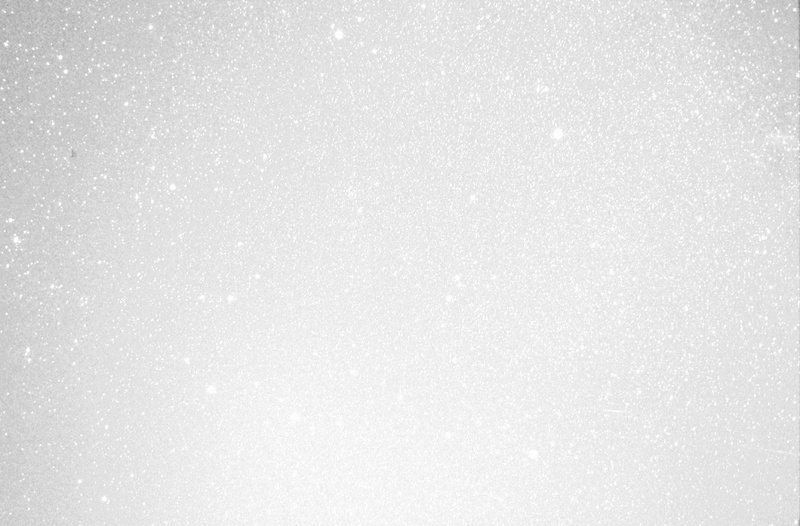 The photo was started long after the meteor had left the trail. RW east of Sterling. : "There was one particularly memorable meteor that fell out of Leo toward the East. It was very bright then exploded at the end. It left a trail that persisted for several minutes. The trail, over time, was actually blown into a loop toward the South." KM in Boulder: "I saw many very bright Leonids, and even a few too low to see down toward the radiant but saw them reflected in my window! I also saw many very fast fainter ones, that under a dark sky were probably pretty good ones! Many fairly long trails, but none stayed around too long. One long one way up north hung around for a couple minutes." BK near Red Feather: "I've never seen so many meteors. The brightest one I saw was by the Big Dipper that exploded and left a smoke trail for 15 minutes. About five times the ground lit up during the night." 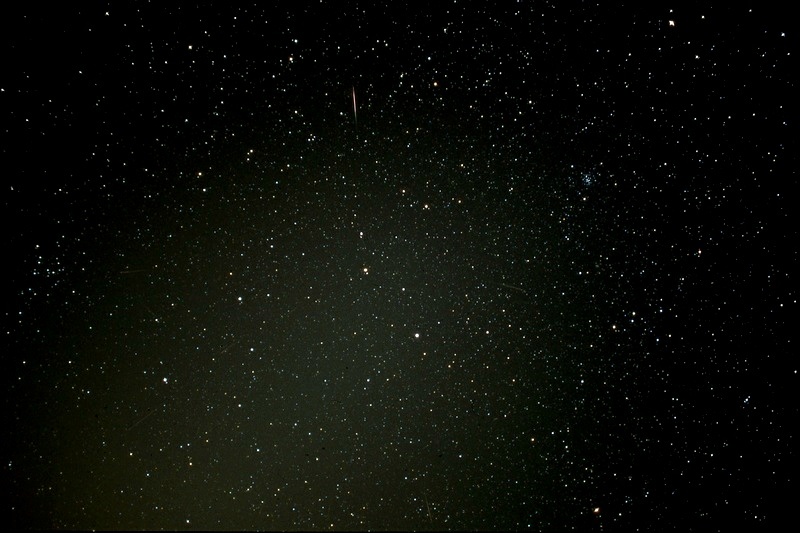 JC in Erie: "A great CELESTIAL SHOW observing from 02:30 until 05:45 in Erie! Thank goodness for coffee!!!" DS in Erie: "Over slept (rats! ), but did wake up at 4 a.m. (whew & yay!) and popped out for a peak. Was greeted/treated by a nice assortment of 3 to 1st magnitude meteors in only a few seconds. After a quick detour back into the house to roust the other sleeping inhabitants, all went back out for another look. "My backyard conditions were OK (for a "city site") with all stars in Little Dipper plainly visible (for a limiting magnitude of around 5.5). Concentrated on the overhead and northern half ("anti Denver") portion of the sky. With approaching dawn (and LOTS of meteors), elected to NOT do an hourly count. Instead, counted meteors in 10 second chunks for the next hour. Quickie summary: ALWAYS had at least one meteor every 10 seconds with a "peak" of 8. Meteors were coming on average of once every 4 5 seconds for an "official" (non ZHR adjusted) rate of 720 900/hour. Saw at least three fireballs that cast perceptible shadows." DD at Cactus Flats: "I did not notice any fall off until well after 4:00 a.m. Even then there seemed to be more fireballs. By this time the Zodiacal Light was brightening the eastern horizon, funny because this usually brings nice reactions but it seemed to be an afterthought to most due to the "other" activity going on." TT at Cactus Flats: "...the 2 hour Zodiacal Light went to the zenith at it's max. WHEWWWwwwww!!!" JS at Cactus Flats: "The Zodiacal Light was incredibly bright! It seemed to have color too. Very nice!" GG at Cactus Flats: "We definitely noticed the Zodiacal Light that stretched high up in the night sky. Pretty strange looking. Several different people in the crowds commented on it." RW east of Sterling: "When the Zodiacal Light threatened from the East, the cameras were simply re pointed to the West." DD at Cactus Flats: "Fighting exhaustion and cold (the wind had come up considerably) I hit the sack with visions of meteors still falling through my truck's windows." KM in Boulder: "When I came in at 4:30 I checked the satellite and it looks like Pawnee faired very well! Excellent!" RW east of Sterling: "Another memorable one entered very close to the radial source in Leo. It was unique in that it appeared to rest in one place and just shine. When it went out, it too left a visible trail (all be it very short) that appeared to have a bend in it." DS in Erie: "One VERY nice fireball about 4:40 a.m. between the "Sickle" of Leo and Regulus (i.e., near the radiant). Several noteworthy items about this fireball: 1. VERY bright (much brighter than Venus at greatest brilliancy, guestimate 6); 2. Much slower and shorter than most of the other Leonids (whoa!, of course, as it was VERY foreshortened since it was an "incoming" meteor... DUCK! ); and 3. Very persistent train. It left a bright patch ("Scutum Cloud ish") that slowly faded to Beehive/Double Cluster ish and finally faded to M31 ish after about three minutes." JS at Cactus Flats: "One that sticks in my mind came straight down from the radiant with two blue explosions followed by a final yellow burst. That was as most of the remaining die hards were crawling into the sack about 4:30 a.m., but several of us whooped for it! The show was still going strong, but a VERY chilly north wind was too, and we had all been out under the late autumn sky for a good ten hours by then. The cold had taken its toll." DS in Erie: "Rate seemed to fall off by 5:00 a.m. and twilight started to close the curtain by 5:30. *SIGH* A nice display and though I've no fotos, all the memories are perfectly exposed and in focus!" KB at Cactus Flats: "I left at 5, and I must have seen another 50 through the windshield, falling in the west!" GG at Cactus Flats: "The cold front moved in about 6 a.m. when the cold winds from the north west started to howl. Longest astronomy night of viewing ever for me - almost 11 hours straight through the night into the pre-dawn glow. We usually do not make it till those early morning hours, so this was kind of a marathon run through the cold night on the high plains. Very cosmic. "After everything was packed and we were on the road heading out (6:00am), A really nice meteor fell right in front of us. The trail resembled the boiling effect that is seen in time lapse photos of clouds. It had a green tint too. One final gift from a night of WOW." JS at Cactus Flats: "The wind became fairly ferocious by 7 or 8 a.m. and everyone was pretty quick to get their scopes torn down and hit the road." Who knows? Maybe these youngun's who braved the cold that night (and hit a deer on the way home the next morning) will be rewarded with that repeat performance someday.